Question 1) In Raganuga bhakti we aspire for the passion present in an eternally perfected brajabāsī – a devotee like a cowherd boy/ gopī/ Krishna’s parents, not a perfected devotee in this world? Rāgānugā is the method of striving for a specific type of passionate relationship with Krishna found in Vṛndāvana-līlā. People like Prabhupāda, Rūpa Goswāmī, and Śrī Caitanya are the ones who explain this, and guide us in how to do it. They are not the Rāgātmikās but they are the guides to the rāgātmikās. We follow their teachings and examples in our own worldly form, our sādhaka-rūpa. Their example is not the goal of sādhana, but it illustrates how the sādhana is to be done effectively. Question 2) A very popular notion propagated by many senior leaders in ISKCON these days (one of the ways they “avoid Raganuga topics”) is that we are all practicing Raganuga sadhana already because we are following Sri Caitanya Mahaprabhu who is Radharani and Radharani is the “perfect Ragatmika bhakta”, so we are following the topmost Ragatmika bhakta-Caitanya Mahaprabhu. Can you clarify this? This is potentially half-correct. They may be doing the sādhaka-rūpa seva correctly, but that is not the complete picture. Rāgānugā sādhana has two simultaneous and complimentary aspects: the external practice (sādhaka-rūpa seva) and the internal significance (siddha-rūpa seva). One thing that is perfectly correct is that Sri Radha “is the perfect Rāgātmikā bhakta.” Therefore the conclusion is that we should follow her for the internal significance of our devotional practices. Sri Krishna Caitanya, her manifestation, is “the perfect realized Sādhaka.” We should follow him for the practicalities of how to tangibly practice with cognizance of the internal relevance of our practice to the ideal bhāva we are inspired for. Caitanya Mahaprabhu considered himself a follower of Radharani. So if you claim you are following him you have to also do so, or at least do something very similar and complimentary (like being a follower of another Vrajabāsī). Otherwise, you are only claiming that you follow Śrī Caitanya Mahaprabhu. Caitanya Mahaprabhu’s contribution to Vedānta is the Rāgānugā mārga. So, one who avoids the Rāgānugā-mārga is not Caitanya Mahāprabhu’s follower. Question 3) Is it possible that a devotee first gets attracted to the passion of a sādhaka like Ramananda raya or Sri Rupa Goswami, and later, as a result, gets attracted to the passion of a corresponding siddha like Srimati Vishaka devi or Sri Rupa Manjari? Or should it always be the other way round (first having passion for mood of a Vrajabāsī and therefore emulating the sādhakas of Gaura līlā)? Our attraction to a sādhaka devotee leads us to become attracted to what they are attracted to – a perfect, passionate relationship with Krishna in Vṛndāvana Līlā. Our attraction to those passionate relationships with Krishna will attract us to sādhaka devotees who very perfectly aspire for them. So, it goes both ways. Question 4) We feel forced into the understanding that we have to develop attraction to Gauranga Mahaprabhu, but unfortunately, we are attracted to Radha-Krishna lila. It is essential to study from the source material rather than relying on heresay. From heresay you may develop misshapen ideas that it is unfortunate to be attracted to Radha Krishna līlā. The truth is there is nothing more fortunate than being attracted to Rādhā Krishna līlā! It is the rarest fortune in existence. Question 5) Where exactly does the sadhana-siddha first go, after achieving perfection in this life, Gaurlila or Vraja līlā? The sadhakas who have attained bhāva take birth from gopīkās in the pastimes of Krishna manifest in this world. When that manifestation de-manifests from this plane, they go with it into the eternal manifestation of Krishna līlā. Question 6) ISKCON propagates the understanding that in Goloka Vrindavan there is a subset or section or a part where Caitanya Mahaprabhu is having his pastimes eternally and devotees who are attracted to Gaur Lila will go there and others who are attracted to Krishna, will end up in Vraja. Is this correct? Frankly, I don’t know if this is “correct” or “incorrect”, but I know that it is not said in Śrīmad Bhāgavatam nor have the Goswāmīs of Vrindavana said it in any literature that I have had the fortune to study so far. My understanding is that Gaura-līlā is an aspect of Vraja-līlā. They are not two separate things. When the angle on Vraja-līlā is to relish the sweetness, it manifests as gopīs, etc. When the angle is to share the sweetness, it manifests as very advanced sādhakas like Śrī Caitanya, Ramananda Raya, Śrī Rūpa Goswāmī, etc. “Sharing the sweetness” implies that it is given to those who don’t yet have it – so how would this manifest in a perfect environment like the “spiritual world”? It doesn’t seem relevant or even possible in that setting. 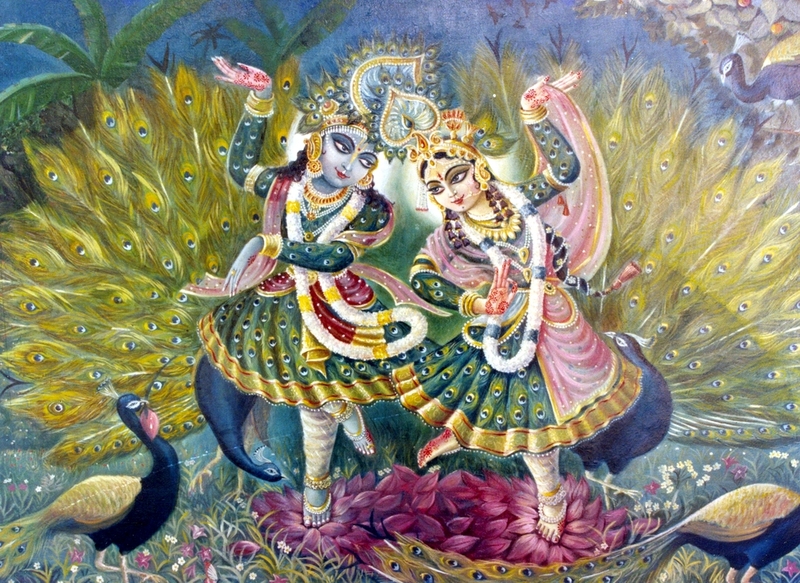 It necessarily manifests where consciousness is bereft of Krishna – this world. This does not mean it is not eternal, this world is also eternal. But in the “spiritual world” it is an intrinsic part of the Vrindavana-bhakti, not distinctly or separately manifest. Look at the cover of Aindra’s book. If you look at it from one angle you see Gaurahari and his associates. If you look at it from another angle you see Śrī Rādhā and her associates. This is how it really is, as far as I am able to grasp the subject. Question 7) For a new bhakta like us, who lacks specificity in our attraction to a particular relationship with Krishna, we should go on reading and hearing Krishna Lila until we are eager/greedy to aspire in the footsteps of a particular passionate Vraja-jana, is this right? Yes, that is in the third of the three verses we are discussing. While you are still developing a specific attraction, then rely on your intellect and wisdom to keep hearing about all of them. Question 8) Why it is sometimes said that only the āsakti sādhaka (very advanced sādhaka) can appreciate Rādhā Krishna līlā? People who are very advanced and conversant with any subject are the only ones who can fully appreciate that subject, but this doesn’t mean no one else can appreciate the subject at all. We develop āsakti, in fact, by beginning to appreciate Krishna from whatever śraddha we initially have. We will develop āsakti for Rādhā Krishna by cultivating our śraddha for them. It’s not that by hearing about Varāha-līlā somehow we suddenly get intense attraction to gopī-bhāva. Yes, a person with gopī-bhāva can nourish their gopī-bhāva even by hearing Varāha-līlā, but a person without gopī-bhāva is not at all likely to get it by hearing about Varāha or Nārāyaṇa. If you want a relation with Gopīnātha, you have to hear about Gopīnātha. Question 9) What role does hearing play in developing an aspiration for a particular passion? Śrī Rūpa Goswāmī explained that hearing Krishna līlā is the crucial foundation of developing an aspiration for its passion. Question 10) Whom should we hear from? We should hear about it from a person who sincerely appreciates its passion and also clearly understands its tattva. Question 11) How do we find such classes that are focused on arousing our attraction to Krishna? Oh, this is the biggest problem in the universe! We are wandering through the universe life after life, until by some incredible luck, we finally get an answer to this question. Such kathā is the rarest thing to find anywhere. Hear about the wives of the brāhmaṇas of Vraja, they got their intense aspiration for Gopīnātha as a result of hearing the “classes” of the gopīs themselves. At least we can hear the verses of Srimad Bhagavatam. Question 12) In ISKCON, we find the classes are more universal and general in order to suit the needs of everyone which arise from variation in the advancement. In my opinion, this is the biggest flaw of ISKCON. Krishna consciousness cannot exist without Krishna Kathā, but I have found the Krishna Kathā in ISKCON to consistently be extremely dissapointing (although on rare occasion it can be very good). It is the greatest dissapointment and the worst failure. A “society for Krishna consciousness” is such in name only if it is not a society of Krishna Kathā. Our Krishna consciousness cannot possibly be deeper than our Krishna Kathā. Question 13) How does one generate the “lobha” (the qualification) to practice Raganuga bhakti? Śrī Rūpa Goswāmī explained that. We generate the aspiration for a passionate relationship with Krishna by hearing about passionate relationships with Krishna.